This neat shrub grows 4-6 feet high and wide, and is thought to be a A. densiflora hybrid. 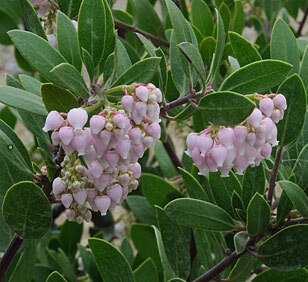 It has the typical dark red, shiny stems, medium green leaves and clusters of pink spring flowers of A. densiflora. Best in sun, with well-drained soil and occasional to no summer watering.